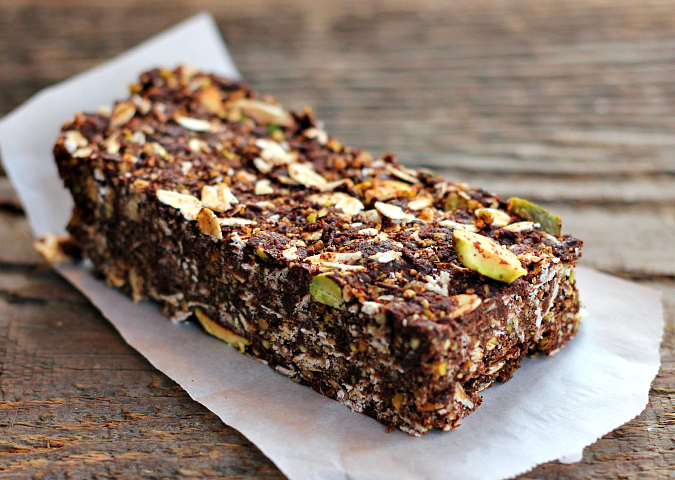 i absolutely love making homemade granola bars. it's great to be able to control exactly which ingredients are in your granola bars, making for a healthy snacking situation. 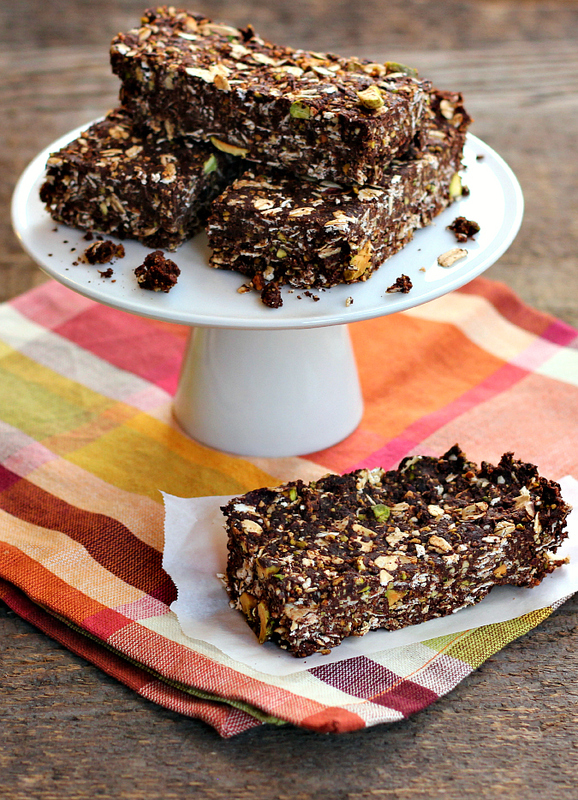 recently i made a batch of no-bake chocolate pistachio granola bars. they only have 6 ingredients in them! there's no need for store-bought granola when it's this easy to make your own! 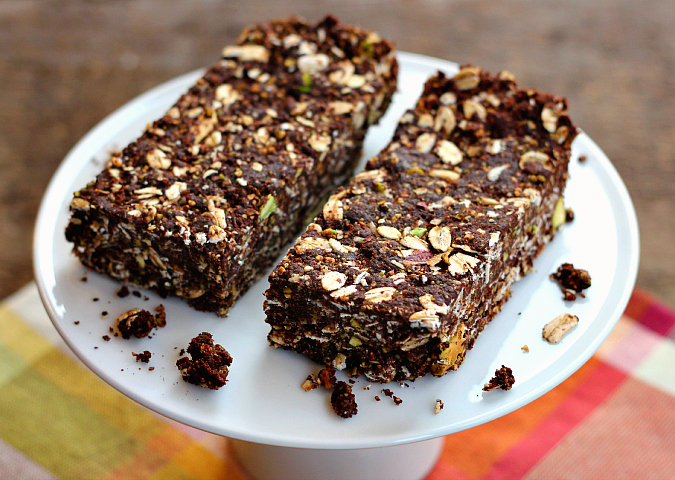 these granola bars make a great snack. they are hearty and healthy. 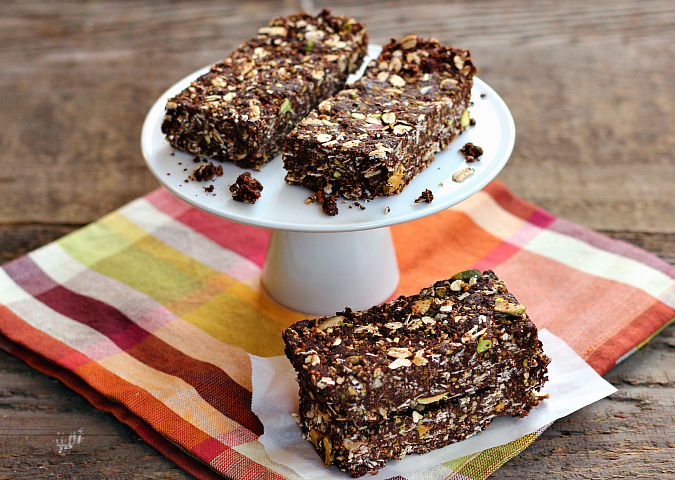 they are loaded with lots of yummy things: oats, pistachios, cocoa powder, dates, peanut butter, and agave nectar. you think you are eating dessert because they are chocolaty, but they are good for you! place 1 1/4 cups of the pistachios to a food processor, and process until finely ground. transfer to a separate bowl and set aside. place the dates in the food processor and process until only small bits remain. add the ground pistachios to the food processor along with the cocoa powder. pulse to combine. transfer the mixture to a large bowl. add the oats and the remain 1/4 cup of pistachios (chopped). stir to combine. combine the peanut butter and agave nectar in a small skillet over medium heat. stir until pourable. pour over the granola mixture and thoroughly mix to incorporate all of the ingredients together. once mixed, add the mixture to an 8-inch square baking pan lined with parchment paper. press the mixture firmly into the baking pan. place the granola bars in the refrigerator to chill before cutting. Look good. I think I tried those at Aunt Ruth's yard sale. I liked the chocolate and peanut butter taste.